Create your first ever, most powerful, verified professional profile and be found by your dream employer. The 21st century skills-economy needs skilled professionals like you. SpringRole lets you create a skills-focused professional profile on the blockchain. You've got skills? Showcase them! Visit BETA.SPRINGROLE.COM and click on 'get started'. Reserve a SpringRole url and signup. Add 3 skills to start with and invite people to endorse your skills. Your profile should be a reflection of you, should be shareable and easily readable. We have designed a profile for the modern world and we have taken it a notch higher by using the blockchain. Every piece of a claim made by you can be verified and once verified, the information becomes immutable and hence your profile will be in it's truest form. List your skills and have your network edorse you. Endorsements from your network are weighted and hence accuratly reflect your skill level. Showcase only what you want to show. From crypto investments to advisory positions to freelance projects and to blockchain verified work experiences and education. SpringRole is powered by the blockchain and what this means is your profile will be verified and attested for every claim you make. Rest assured, this will be 'the' only resume you will ever need to share with employers. Explore and find jobs. Get hired. Find and work on freelancing opportunities. Earn SPRING tokens on SpringRole and convert them to real money. become part of the new skill based economy. 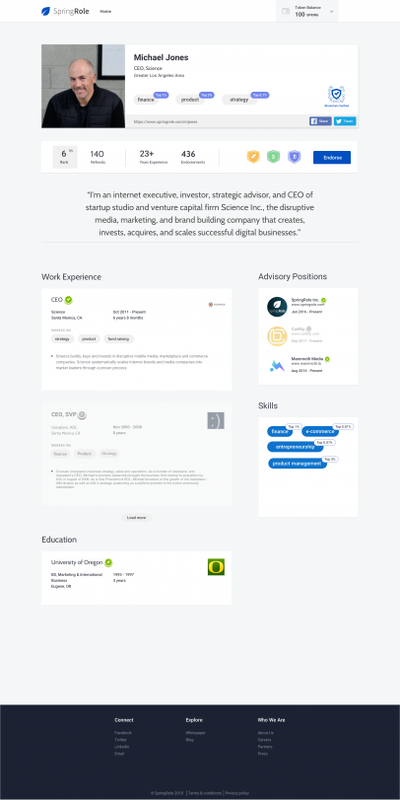 "SpringRole builds a better way for companies to recruit, eliminates fraud from professional reputation, and gives real value to online endorsements." Mike Jones, Co-founder & CEO, Science Inc.
"Before blockchain, it was challenging for freelancers in complicated fields to prove their value and skills. SpringRole makes verifying those skills easy." "SpringRole is taking an important and risk-managed approach to solving a massive problem in the HR industry globally." Why should you create a SpringRole profile?